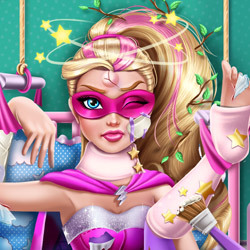 Description: Super Doll is on her way to fight another crime with her cute sidekick, but while they were flying our heroine crashed into a billboard. Hurry to the super secret hospital and heal Barbara! Super Doll got hurt really bad, so change her into a comfy robe and begin the treatment. Become Barbara`s superhero by disinfecting her wounds, getting rid of nasty sticks and placing casts, and she will be ready to save the day.